Throughout the year there are plenty of organized 5k runs (Thanksgiving Day Run is my favorite) and walks in the park, but these workout options are available anytime you’re ready to get up and go. Everyday (especially during the weekend), runners, bikes and walkers take advantage of the more than 65 miles of trails that weave through the gardens, museums and less crowded areas of the park. Five gateways throughout the park lead into 19 well-marked trails with distances ranging from half a mile to just under 7 miles. Each gateway has an information sign with a map of the numbered trails, so all you need to do is pick a route and start following the signs. My personal favorite is Trail 4 starting at 6th and Upas. It’s 5.4 miles and really makes you work for it thanks to the elevation changes. The hills up Pershing Drive (please run along the Mountain Bike trails on the west side of the road) and Florida Canyon separate the strong from the weak! While still part of Balboa Park, the often overlooked Morley Field Sports Complex comprises 47 acres on the eastern side of Florida Canyon. The multipurpose park offers a wide range of outdoor activities including 25 tennis courts, a swimming pool, multi-purpose fields, velodrome, bocce ball courts, disc golf course, a fitness parcourse (PDF), petanque courts and Balboa Park Golf Course. Surround yourself with some of the greatest masterpieces or escape to a tranquil garden during a yoga session at one of Balboa Park’s museums. The San Diego Museum of Art’s Yoga at the Museum invites you into the galleries for four to six-week courses that will use yoga to increase creativity. The Japanese Friendship Garden helps you relax the body, calm the mind and get ready for the day with Morning Hatha Yoga sessions on Thursdays in the serenity of the Garden. In 1947, the “Palace of Electricity and Varied Industries” building, originally built for the 1935 exposition, was renovated into the current Municipal Gym. The three indoor courts are home to youth and adult basketball and volleyball leagues in addition to San Diego Adaptive Sports Foundation events and tournaments. Whether it’s bootcampers, navy personnel or an amateur soccer team, there are plenty of groups working out in Balboa Park every day. Moms can bring along the young ones for a group workout throughout the park with Stroller Strides. Those looking for something different should stop by for a free session of Laughter Yoga. Or for more relaxed but competitive exercise, play a round of lawn bowling! Tucked beneath the Cabrillo Bridge sits the most unlikely Balboa Park attraction, an archery range. For a small fee, the forest-like range offers 40 targets that can be shot from different ranges. Think you are the next Robin Hood? Then prove it at the annual San Diego Archers’ King Arthur Tournament in June! 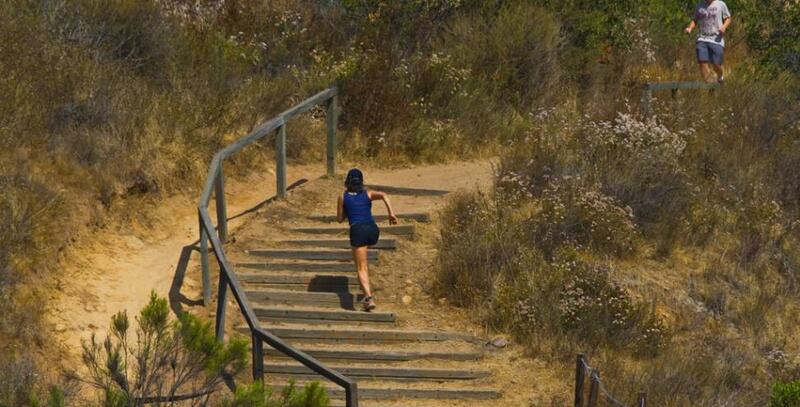 Got a favorite spot to exercise in Balboa Park? Let us know what you like about it in the comments below. This entry was posted in Attractions, Insider Tips, Outdoor Adventures and tagged balboa park, biking, exercise, mothers, running, swimming, tennis, trails, working out by Brent Bernasconi. Bookmark the permalink.